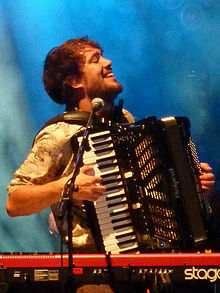 Born in Cardiff, Wales in 1986, Ben Lovett met Marcus Mumford while they were students at Kings College in London. Along with Englishmen, Ted Dwane and Winston Marshall, they magically came together in 2007, to form Mumford and Sons, a name more evocative of an old time blacksmith or haberdashery, rather than a band. 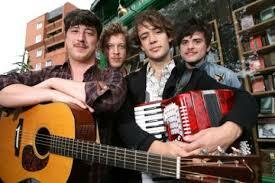 Mumford and Sons debuted with an EP in 2008, Love Your Ground. Their first full length studio album, Sigh No More, was released in 2010. While promoting their album in the U.S. in 2011, they credit their introduction to American Roots music to Emmy Lou Harris and began writing songs for their second studio album. These songs would eventually become part of their next album released in 2012, Babel. Also in 2011, Mumford and Sons toured the U.S. with the Old Crowe Medicine Show and Edward Sharpe and the Magnetic Zeros on the inaugural Railroad Revival Tour. This tour was inspired by the Festival Express tour across Canada in 1970 that featured Janis Joplin, Buddy Guy, The Grateful Dead and The Band. Winning awards since 2010, notably the Grammy for Best Album in 2012, for Babel, the British band has distinguished itself by becoming known as an Americana band, although none of the members were born or raised, American. This has offended some, and inspired others. Is it possible for someone who has not participated in the American Experience to incorporate the values and vision of America and to reinterpret it, and sell it back to us? To understand that they have done this, one must understand something about the Americana genre and how it is different. Americana is not a preservationist genre of music. It recognizes that Americans have a deep past, always migrating from somewhere else, bringing along with them, their experiences and melding them together with each new beginning. Like a language, Americana music is ever growing, moving and reinventing itself. Music, no matter how exclusive and rarified, has little meaning in the social context, if no one relates to it or cares about it. America listened to Mumford and Sons and it seemed to recognize that they were special. In turn, Mumford and Sons has become a highly visible and influential band in American music. The presence of the piano accordion in this band, more than any other event to date, has meant an exciting resurgence in interest in the instrument in the US. Since co-founding Mumford and Sons, Ben Lovett has evolved as a multi-instrumentalist, producer, as well as founding a record company and a live music promotion team in the UK, Communion. Lovett produced Ellie Goulding’s critically acclaimed album Lights in 2010, as well as a self titled album for Simon Felice, formerly of the Felice Brother’s, in 2011.